Magneti Marelli exhibits its main innovations at Auto China 2016, with particular focus on lighting, hybrid solutions and lightweight materials. The company is celebrating twenty years of presence in the country with a stand that shows the best in automotive technology aimed at a strategic market which continues to grow. On April 21st Magneti Marelli has just opened its new Chinese “headquarters” in Shanghai. The new building also includes an important Research and Development center for the Powertrain and Automotive Lighting business areas. From 25th April to 4th May, Magneti Marelli is taking part in Auto China 2016 in Beijing, the top-level Asian show dedicated to the four-wheeled world. Magneti Marelli is present with an exposition space which examines the theme of “New roads for innovation”, with the showing of solutions from all of the company’s business areas, with applications in the field of lighting, engine control and electronic systems, suspensions, shock absorbers, plastic modules, exhaust systems and motorsport. At Auto China, Magneti Marelli confirms its positioning as a global supplier of technology which is present in all of the strategic regions of the automotive world, including Chinese area, which is in continuous growth (24 million vehicles produced in 2015, +4.5% compared to 2014), recording, for a number of years now, growing interest in hybrid and electric vehicles with production figures which stand at approximately 170 thousand in 2015 with an estimated growth of +49% in 2016 (source IHS, data from March 2016). Pietro Gorlier, CEO of Magneti Marelli, stated: “Our presence at Auto China Beijing is crucial to confirm once more Magneti Marelli’s commitment in Chinese market, with important investments in terms of R&D, technology and industrial capability. Currently our presence in China has become relevant from a geographical and industrial point of view, both for quantity and quality, and we will keep on exploiting our potential at the maximum level, leveraging all our plants, in order to further boost our growth in the most important market in the world. Our enlarged footprint is enabling Magneti Marelli China to a further acceleration in our growth” – said Sylvain Dubois, Chairman of Magneti Marelli China. “This exhibition displays the top of our technology offer aimed at China, as we want to bring added value innovation to this market. 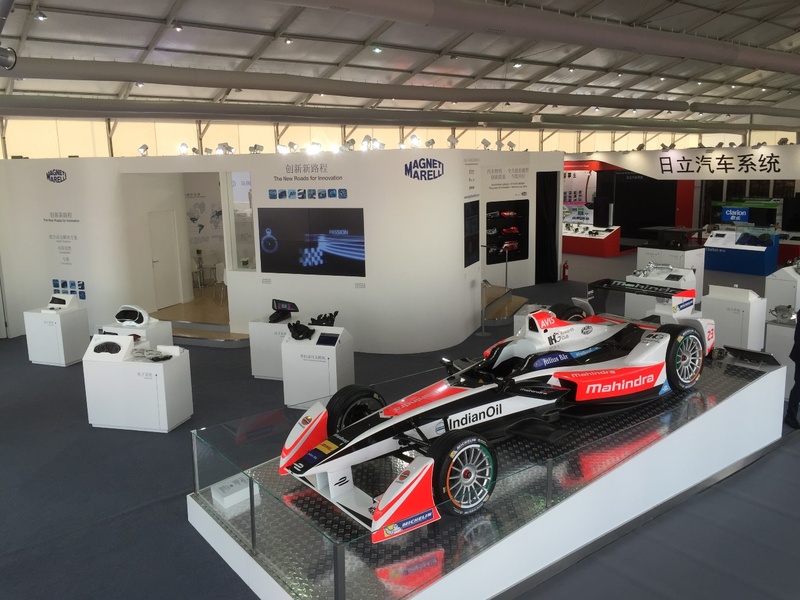 The Mahindra Formula E car at our stand is a perfect example and symbol of this direction: testing new technology (hybrid and electric powertrain and electronics) in an high performance environment”. Magneti Marelli’s exhibition space in Auto China is therefore oriented around the theme of continuous innovation, with particular attention to electric hybrids, lighting and lightweight materials. With regards to lighting, inside a “lighting demonstration room”, visitors will be able to see an important summary of the technological excellence of Automotive Lighting through the showing of the most significant headlights and lighting clusters recently supplied to the best car manufacturers in the world. Heading the list is the full-LED headlight which is supplied on the Volkswagen Touran, with the first ever completely integrated electronic management system, controlled by two actuators able to generate a combination of eight different dynamic illumination functions. The stand also displays eight different examples of “styles” applied to the DRL (Daytime Running Light) modules and rear lights, as well as three headlights which demonstrate the application of different illumination solutions, ranging from adaptive Xenon to LED, derived from forms of eLight technology (applied to Mercedes-Benz C Class). The full-LED headlight with laser module will also be displayed, the first application in the world, adopted by Audi for their Audi R8 sport model, a system capable of supplying a full-beam with a depth of over 500 metres. The rear lights displayed represent an ideal synthesis of technology, design and safety, and all use LED modules with various configurations and style details, starting with a LED solution for the Honda Elyson, to arrive at a “crystal design” solution (Ford Mondeo) and with 3D illumination technology (BMW 7 Series). Moreover, the lights for the Honda Elyson and the Ford Mondeo are manufactured in Magneti Marelli’s Chinese plants. The presentation of lighting systems is completed by the 3D modules with hologram technology adopted by Mercedes-Benz and BMW. Hybrid systems represent key technology for which China is becoming a key market. Magneti Marelli boasts a decade of experience in the competition world, where efficiency and performance are concepts raised to the highest levels. The 48 Volt PERF.E.T. (PERForming and Efficient Transmission) hybrid system is the ideal synthesis of the process of technology transfer between the worlds of “racing” and the “road”. PERF.E.T. is a combination of road applications derived from the electronically actuated AMT (Automatic Manual Transmission) and KERS (Kinetic Energy Recovery System) for F1: the electric motor produces torque during gear changes and at the same time allows for the reduction of fuel consumption. In the field of hybrid solutions, Magneti Marelli motor generators are considered the best in their class, thanks to their elevated flexibility, which allows them to be associated with all of the various hybrid systems. Remaining in the powertrain sector, Magneti Marelli is presenting high and low voltage electric motors and high voltage inverters at Auto China. In the same sector, ample space is also dedicated to technology made in Magneti Marelli plants in China, such as the motorised throttle valve made with super-light materials and 600 bar GDI (Gasoline Direct Injection) systems complete with pump, injector and electronic control unit (ECU). Suspension systems bring to Beijing adopted solutions using the most up-to-date technology with lightweight materials: carbon fibre for the front axle, aluminium for the hubs used in the multilink suspension and rear axle for the Jeep Renegade. Innovation in the field of weight-reduction, with the use of aluminium also for shock absorbers. Again in the shock-absorber field, dual stage valves. The electronic systems area proposes technology adopted for the creation of instrument panels (Audi A4 with 7” TFT displays), a demonstration of the advanced armrest touch HMI, the smart antenna and the infotainment system for the Alfa Romeo Giulia fitted with a black panel effect TFT display up to 8.8”, which integrates innovative optical bonding technology aimed at an optimal readability of the screen. Remaining in the field of electronic systems, body computers produced in China for GAC FCA and various local Clients will be on display. A lot of Magneti Marelli Motorsport technology is adopted in world championships of the highest level and will be on display at Auto China. Among these, particular focus will be placed on energy storage systems such as 60 and 120 kW KERS (Kinetic Energy Recovery System) and 50 kW HERS (Heat Energy Recovery System), as well as solutions adopted in Formula E (6-phase 300 kW motor generators and 3-phase 150 kW inverters). The stand showcases the new Mahindra M2Electro which took part in the FIA Formula E Championship fitted with Magneti Marelli Motorsport technology. The Mahindra Racing Team, which includes the drivers Nick Heidfeld and Bruno Senna, has chosen to rely on the know-how of Magneti Marelli, developed over more than 90 years of competitions at the highest levels, in order to take on the challenges of this future-oriented championship. Mahindra just announced on Friday a partnership with Magneti Marelli to provide powertrain components for Mahindra Racing’s season three Formula E car, the M3Electro. Magneti Marelli’s presence at Auto China concludes with Exhaust System adopted technologies (moulded silencers with variable sections and catalytic converters for aspirated and turbo engines), Plastic Components & Modules and the aftermarket activity of Magneti Marelli Checkstar. Magneti Marelli is at Auto China in the W1 hall, stand W01. Taking place every two years, the 2014 edition of Auto China saw the presence of over 850 thousand visitors in an area of approximately 230 square metres. The show will be open from 25 April to 4 May 2016 in Beijing, at the China International Exhibition Centre New Venue (Tianzhu) and the China International Exhibition Centre Old Venue (Jinganzhuang). Magneti Marelli has a consolidated presence in China. In 2015 it recorded a revenue of 446.4 million € (409.8 million € in 2014; 378 million € in 2013; 287.4 million € in 2012; 240.7 million € in 2011; 232 million € in 2010; 162 million € in 2009) with the employment of approximately 3500 people who currently work for the company in China. The new management structure is, more precisely, located in the North East area of Pudong and covers an area of over 22,000 square meters, of which about 6,500 are devoted to the two R&D laboratories. The new headquarters will accommodate around 550 people at the end of 2016, reaching approximately 700 people in 2018. Of these over 350 will be engineers and technicians involved in the activities of the R&D and product development centres. Opening of the new offices was held on the occasion of the 20th anniversary of the presence of Magneti Marelli in China. Besides the new Chinese national company headquarters of Magneti Marelli in Shanghai, the company’s activity in China is currently spread over diverse areas of the country with 11 production plants: R&D/Engineering in Shanghai (Headquarters, Powertrain in JV with SAGW), Wuhu (Automotive Lighting and Powertrain), Guangzhou (Electronic Systems), Hangzhou (Shock Absorbers in JV with the Wanxiang Qianchao Company), Changsha (Exhaust Systems with Fiat/GAC), Changchun (Powertrain in JV with FUDI), Hefei (Exhaust Systems in JV with JAC and Lingdatang), Foshan (Automotive Lighting), and Xiaogan (Automotive Lighting in JV with CSI). Magneti Marelli is also active in China on the social channels “Weibo” and “WeChat”, the most widespread social media in China. Additionally, Magneti Marelli’s company website can be viewed in Chinese at http://www.magnetimarelli.com.cn.